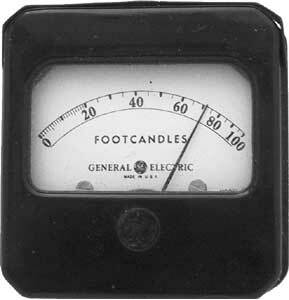 I believe this is the first GE exposure meter for commercial sale, but I haven't firmly established it. It's obviously the basis of their subsequent meters. If you fit a simple cap to it, you get the DW-47 which came out only a couple years later. This is about as simple as it gets, just a box with a cell on the edge and a diffuser over it. It reads directly in foot candles, so you just hold it up and read the ambient light. There are two hash marks on the top that are multipliers for brighter light: if you cover the first hash mark, you multiply the foot candle reading by 3. If you cover the second hash mark, you multiply by 10. There's also a little tin mask that fits over the sensor for very bright light. This one is very much like the later GE Model 213 —it appears to be meant for measuring the light in work areas, rather than for exposure. I was lucky enough to get a manual for it, and the manual suggests proper light levels for different environments, but no mention of photography.